Eugene Powell a.k.a "Sonny Boy Nelson"
Eugene Powell was born in Utica, Mississippi, December 23, 1908. He started playing the guitar at age eight. His mother ran a juke house so he grew up around music. He took the name "Sonny Boy Nelson" after his step father. Although he farmed, ran juke houses and bootlegged he was more of a traveler, pursuing his love of music throughout the Delta. As a young boy he played plantation parties, fish fries and house frolics, even staying with white plantations owners days at a time entertaining his family and guests. His excursions across the Delta engaged him in many different styles of music. As reported in Living Blues magazine in 1976, Eugene was renowned for many different stylistic guitar pieces of Blind Blake, Blind Lemmon Jefferson and Lonnie Johnson. This along with his own unique style made him a much sought-after musician in the Delta. He played with such greats as Sam Chatmon, Bo Carter, and Walter Vinson. His early experiences around Hollandale were with Robert Nighthawk, Robert Hill, and the great blues instrumentalist Richard "Hacksaw" Harney. He played different venues for blacks and whites, from blues to popular music. Around 1934 he was hanging out around Marion, Arkansas playing with the local talents of that area. In 1936 Eugene and wife "Mississippi Matilda" along with Willie "Brother" Harris traveled with the Chatmon Brothers to New Orleans to record for the Bluebird label. It is told that Eugene added a seventh string to his guitar for the recording. Eugene often worked on guitars and modified his own to seven and nine strings. He had a unique style of playing laptop with a knife for a slide. In the 1940's he was working for the John Deere Company in Greenville, Mississippi and playing in the Lewis Nichols band. In the sixties he saw a decline for his music locally and gradually quit playing publicly. Sam Chatmon encouraged him to play again and carried him to the Festival of American Folklife in Washington, DC, where he was recorded for the Adelphi label in 1970 and 1972. Eugene's tunes like "Street Walking Woman", "44 Blues", and "Suitcase Full of Troubles" along with "Meet Me In the Bottom" are forever forged in blues history. He continued to play festivals and events throughout the south along with some travels to Washington and Chicago. In the early 90's he suffered some health problems but endured and continued to play. Eugene suffered from a broken hip in the spring of 1998 and through many trials and tribulations ended up in Arnold Avenue Nursing Home in Greenville, Mississippi. 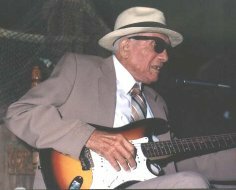 While recovering and adjusting to life in a nursing home his most prized possessions, his guitars, were taken from his home. In September, 1998, thanks to M.A.C.E. and the Friends of the Festival, Eugene was presented a new Fender 12 accoustic string guitar by Worth Long and a lifetime achievement award by Butch Ruth. Upon hearing of Eugene's predicament, Hartley Peavey president of Peavey Electronics in Meridian, Mississippi donated a new Peavey electric guitar and amplifier to the Delta Blues legend. The equipment was presented in October at a surprise celebration for Eugene at the Walnut Street Bait Shop in Greenville. Friends, fans and other Delta blues greats such as Lil' Bill Wallace, T-Model Ford, Willie Foster and John Horton helped celebrate with Eugene. Other gifts were made possible by Libby Rae Watson, Axel Kustner, musicians in Germany, The Music Maker Relief Foundation,Inc., and local fans. On November 4, 1998 at 5:41 am Eugene Powell died at Delta Regional Medical Center in Greenville, Mississippi. He was buried at Evergreen Cemetery in Metcalfe, Mississippi. He was survived by his wife, one son, five daughters, thirty-three grandchildren, sixty-one great grandchildren and two great-great-grandchildren. On April 10, 1999, The Mount Zion Memorial Fund, Inc., a Mississippi Non-Profit group, will have a graveside memorial dedication at The Evergreen Cemetery in Metcalfe, Mississippi followed by a reception. Benefits for the memorial will be held at the Walnut St. Bait Shop in Greenville. Donations for the memorial can be sent to: The Mount Zion Memorial Fund, Inc., P.O. Box 3872, New Orleans, La.701 77-3872. For more info, contact Butch Ruth at 601-334-6054 or e-mail, euphus@tecinfo.com. *Editor's note - Butch Ruth is a well known photographer who has photographed most of the Blues Festivals in the Delta Region. Ruth was caretaker for Eugene Powell for the last six months of his life.